In a medium bowl, beat egg yolks with the sugar and salt. Blend in the milk, lemon juice, lemon peel, and butter, beating well. Add the flour and baking powder. Beat egg whites until stiff and fold into batter. 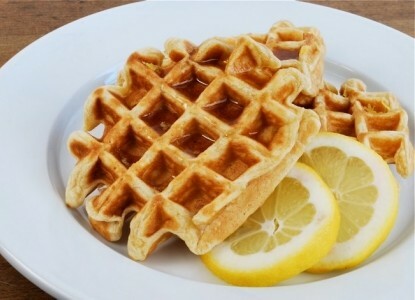 As usual, bake in a preheated waffle iron until golden brown and steam no longer escapes iron. If you don't want maple syrup, try topping with fresh berries and yogurt.